Because of its remote location, traveling to Drake Bay is part of the adventure. Drake Bay is the real Costa Rica where nature is still king. Most international flights arrive into San Jose (SJO), the capitol of Costa Rica. There is another international airport in the northern part of the country named Liberia (LIR). SJO is the preferred airport for flights to Drake Bay as most local flights depart from SJO. You have two choices when flying to Drake Bay. You can fly direct to Drake Bay Airport and take a 20 minute taxi ride to the town of Drake or to your lodge. The other option is to fly into Palmar Sur Airport; when you land you take a short cab ride to the town of Sierpe and board a river taxi to Drake Bay. This is a beautiful 45 minute ride down the Sierpe River, the home of one of Central America’s largest mangrove forrest. Your boat captain will often stop to point out wildlife along the way. Once you cross the mouth of the river, you take a left in the Pacific Ocean for about 15 minutes and you have arrived in paradise. The boat will take you either to your lodge or the main beach in Drake. For clients of Fish Drake Bay, we also offer a private boat which can take you directly to the Reel Escape or the Reel Time. 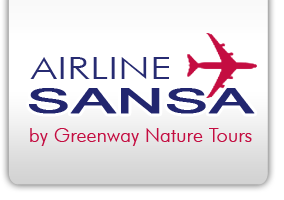 There are currently three intra-country airlines that fly in to Drake, Sansa, Skyway and Aerobell. Aerobell leaves from Pavas airport which is a 20 minute taxi ride from SJO. There are also several private charter airlines available, contact us for details. Depending on what time your flight arrives in San José will determine whether you will fly to Drake Bay the same day or the next morning. In the high season (December-April), there is usually a morning and afternoon flight available. There are many hotels within ten minutes of the airport; the Marriott is our favorite! We also have a partnership with a transportation company should you need their services to get you to and from the airport and hotel. If you prefer driving to flying, we have partnered with a first class transportation company that will drive you to Sierpe to catch the river taxi. It’s an easy 4.5 hour drive on good roads from San Jose to Sierpe. We do not recommend driving all the way to Drake Bay especially during the green season due to unpredictable road conditions. IMPORTANT NOTE REGARDING PASSPORTS: Please note that it is important that you inspect your passport and insure that it is valid for 3 months AFTER you return home from Costa Rica and that it is not torn or that it does not have ragged edges as Costa Rica Immigration will not let you enter the country. You should also contact your credit card company prior to traveling and notify them that you intend to travel to Costa Rica. Otherwise they may not allow charges. For more information on transportation and getting to Drake Bay, submit questions through our Contact Us page.